I expected the sport to use this opportunity to send everyone a life-size poster of Albert Pujols to match the rest of the propaganda they’ve spread on his behalf this All-Star season, so I’m not sure what think. Does this inclusion of Scott Rolen in an MLB email signal the end is nigh? Well, the end of All-Star voting definitely *is* nigh. Go now. Vote. Vote. Vote! Remember, you get 25 votes per email address per day, so even if you’ve already voted, you can do it again to help put Rolen over the top. Yahoo!, Hotmail, and Gmail are your partners in making your voice heard. The final All-Star vote tally before the one that decides the line-up is now available. Joey Votto, Brandon Phillips, Orlando Cabrera, and Jonny Gomes hang in there in their races, but Scott Rolen is actually within striking distance. Ken Griffey, Jr. was on the All-Star line-up in 2007, and before that the last Red to appear was Barry Larkin in 2000. Two voted in the last 10 years? Don’t you think we ought to do something about that? Hell, Rolen himself has appeared in the line-up that many times in that many years. Let’s send him again. Remember, you get 25 votes per email address. Yahoo!, Hotmail, and Gmail are your partners in making your voice heard. It also appears you can vote 25 times per email address per day. At least I’ve been able to cast votes on different days with the same email address. Why not try it out for yourself? 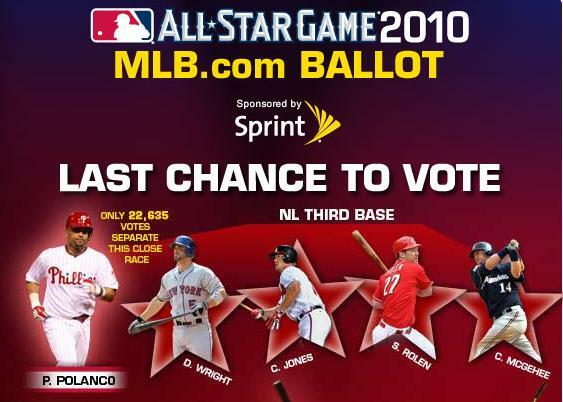 Posted in Brandon Phillips, Cincinnati Reds, Joey Votto, Ken Griffey Jr, NL Central, Scott Rolen, Vote Votto. Forget about the Large Hadron Collider in Geneva. The danger of particles creating a micro-black holes large enough to destroy the galaxy is nothing compared to the danger of B-Phil and J-Roll on the same field at the same time. What would happen should these two middle-infielding celestial bodies collide? The gravity well of awesomeness might consume the Milky Way in three-tenths of a second (or the amount it takes to flip a double-play ball, whichever is shorter). Or worse, we might be sent back in time to the Dave Miley era. Argh! Someone moved Adam Dunn’s armchair! On this night, though, we escaped the galactic destruction and just saw the B-Phil side of the equation win out. Probably it was the universe evening out his recent arrest somehow. 72 in a 35? Hasn’t he seen the commercial where the lady stops just in time to avoid hitting the dumb girl who runs out into the road in front of her, only to be rear-ended herself? Talk about a Pay It Forward ending. Johnny Cueto was kickin’ it, giving up one earned run on six hits and two walks through eight innings. Bill Bray was somewhat less awesome, giving up a two-run homer in his single inning of work. Lucky for him, the 18 ERA he earned in his first appearance in the majors this season wasn’t so much of a problem, what with the offense coming through with the seven runs and all. Orlando “Lando” Cabrera, Joey “Vote” Votto, Ramon “Filling in” Hernandez, and Chris “Why must the outfield be so full” Heisey each contributed an RBI to that total, with Scott “Keep this inning” Rolen came through with the other three. He also smacked his 300th career home run tonight, with him family in attendance and everything. Boy, that was easy. I remember when Ken Griffey, Jr. used to approach those big round numbers and it would take a damn month for him to actually hit it. Tomorrow the Reds send Mike Leake out against Joe Blanton at 7:10 p.m. The other day, MLB sent me an email inviting me to return to the All-Star voting page. Of course, I had long since voted 25 times, but when I went back, I was able to cast 25 more votes. I took a glance at the rules, but it wasn’t clear to me whether you could vote 25 times per day, but why not go and try it for yourself? Posted in Cincinnati Reds, Game Wrap, Vote Votto. Awesomest. Thing. Ever. I wonder what kind of shape Hammer has kept himself in. Please Hammer, don’t hurt yourself. CINCINNATI (June 24, 2010) – Legendary hip hop performer and Grammy Award winner MC Hammer will bring his high-energy show to Great American Ball Park on Friday, July 16 as part of the celebration of the 1990 World Series Champion Cincinnati Reds. MC Hammer’s pregame concert will run 6 to 6:40pm on the right field porch and a second show will be on the field starting approximately 20 minutes after the conclusion of the game. He will also do a meet and greet with fans in the FanZone. Hammer is best known for a series of chart-topping hits in the late ‘80’s and early 90’s including “Too Legit to Quit” and “U Can’t Touch This,” which was Billboard’s Hot R&B/Hip-Hop #1 single in June of 1990 and the unofficial anthem of the 1990 Reds. Hammer is a huge baseball fan and served as the batboy for the Oakland A’s from 1972 to 1980. 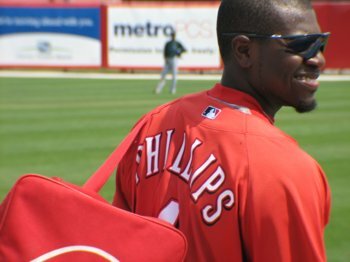 Today’s Human League “What I Love About” honoree is the NLC’s Hottest Baller of 2008, Brandon Phillips. What I love about Brandon Phillips is his glove and his back-handed flip to second. It’s a beginning to a double-play so beautiful that it makes his move to 2B all worthwhile. What I love about Brandon Phillips is his attitude. Kinda sassy, a little arrogant, but still willing to slow down enough to explain what “crunked” means to a Reds beat writer. I love that he’s not perfect and needs to have a kick to the seat of the pants sometimes. I love that he’s up and down with the team, feeling the energy of the city. What I love about Brandon Phillips is that horrible commercial that he and Joey Votto were in at the beginning of the season–I think it was for Subway–where the director had to position the camera man ever-so-carefully so you couldn’t tell that there was no one in the stands as they got the out at first–presumably tagging out the high saturated fat you’d get at a burger joint. What I love about Brandon Phillips is watching him turn it on when the Indians come to town. That’ll show ’em. What I would really love about Brandon Phillips would be seeing him starting in the All-Star Game, but he needs your help to make that happen. Vote, vote, vote!! Posted in Brandon Phillips, Cincinnati Reds, Vote Votto.